Perched on a leafy hilltop overlooking Mexico City, is Chapultepec Castle (Castillo de Chapultepec in Spanish). You won’t just be blown away by this magnificent estate, it’s luxurious interiors and sweeping views, but the incredible timeline of Mexican history it has witnessed. Chapultepec Castle is the secret must-see of Mexico City. In 1785, Mexico was under colonial Spanish rule and leader Viceroy Bernardo de Gálvez decided he was in need of a summer residence. Construction of an opulent palace began on a prominent hill overlooking Mexico City, surrounded by forest. The residence took its name from that of the Hill, “Chapultepec” which was derived from the local indigenous language meaning “on the hill of the grasshoppers.” Unfortunately for Viceroy Gálvez, he contracted typhus and died long before his sumptuous abode was completed following Mexican Independence in 1821. The Spanish Crown ordered the luxurious home to be sold, however, no one was interested in purchasing the property. The Royal Treasury auctioned it off in pieces -windows, doors, and other valuable furnishings. The City of Mexico finally purchased the remaining shell in 1806 and in 1833 decided the abandoned palace would be converted into a military college. Reconstruction of the college began more than a decade later in 1841. Among several changes made to the building’s architecture, was the addition of a tower “caballero alto” (tall knight) to create a more fortified appearance. This is when the palace became known as a “castle”. Along came France in 1861, to collect on foreign debt. Emperor Maximilian of Austria and his Belgian wife Empress Carlota were installed as the new Mexican monarchy. They selected Castle Chapultepec as their home address and refurbished it to their lavish royal taste. Max and Carlota favoured the eastern aspect of the Castle for its panoramic vistas over Mexico City, Lake Texcoco and two nearby volcanoes. They added a black and white tiled terrace to savour the views outside their living quarters. Maximilian’s monarchy only lasted three years before he was dethroned and executed. However, the eastern part of Chapultepec Castle retains the look and feel of their era in residence, today. In 1878 Chapultepec Castle became the home of the National Astronomical Observatory. It was adapted to suit stargazing including the addition of a dome to the “tall knight” to accommodate a telescope. The Observatory relocated in 1883 and once again the Castle defaulted to a military college. This time however it shared space with President Porfirio Diaz during the summer months. Porfirio Díaz was the first Mexican president to use Castle Chapultepec as his home. He wanted the Castle to showcase the artistic and technological progress of Mexico to foreign visitors, so he added elevators, a bowling alley and other fashionable innovations of the time. Diaz also established a commission to turn the surrounding forest into a public space, now known as Chapultepec Park. Finally, in 1939, President Lázaro Cárdenas decreed Chapultepec Castle a national heritage site and venue of the National Museum of History. The palace was restored during the early 1940’s and tailored to the needs of the museum collection. The Museum houses murals by Mexican artists such a David Alfaro Siqueiros and Juan O’Gorman, and José Clemente Orozco. It also has a collection of horse-drawn carriages including the Cinderella-esque ceremonial carriage used by Maximilian and Carlota. Catch the Metro to Chapultepec Station or take a taxi/Uber. As previously mentioned, Chapultepec Castle is located on a hilltop in Chapultepec Park. This requires you to walk about 1.5km from the closest Park entrance on Paseo del a Reforma and 1.8km from the nearest Metro station. Once passing through an initial security check, the path makes a steady incline to the top of the hill, so wear comfortable shoes. No food or drink is allowed inside. You’ll probably want some water after your short hike up the hill, but make sure you drink it all before the security gate. The Chapultepec Castle entrance fee is 70 pesos (approx. USD 3.50). Sundays are free for Mexican citizens and permanent residents, so it is an extremely busy day to visit. If you must visit on a Sunday, be there as early as possible to avoid a long queue at security. From what I can tell, there are no official guided tours offered at the Castle and signage is generally in Spanish only. All Chapultepec Castle tours appear to be available from third-party providers. 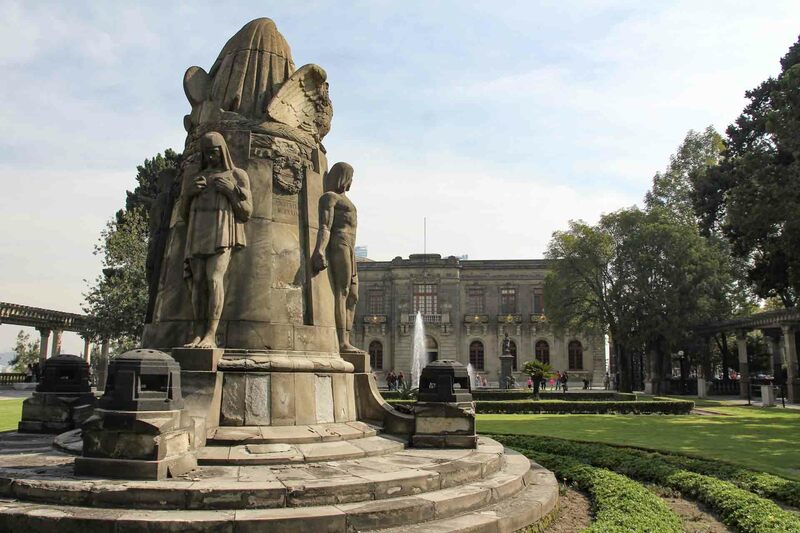 Chapultepec Castle visiting hours are Tuesday through Sunday 9am-5pm. To pre-purchase Chapultepec Castle tickets, see the visitor general information here. From it’s hilltop position, Castle Chapultepec has observed many socio-political changes over the last 230+ years. It has been adapted to accommodate the diverse needs of Mexico’s tumultuous past and the personalities of its most affluent and influential residents. Admiring it’s architecture and museum collection is the perfect site for a brief and engaging Mexico history lesson.